Our inability to set reasonable goals: Someone looking to lose weight might resolve to completely cut out junk food and go to the gym six days a week, when what they would be better off aiming to do is cut their junk food intake down, mix in some salads, and try to get to the gym three times a week. The presence of external factors in our resolutions: While your resolution may be to advance your career by getting a promotion, this is not in your control. In this situation, your boss holds too much power over whether or not you achieve your goal, and thus your resolution, which is supposed to empower you, has been stripped from your hands. Emphasizing what we ‘should’ do, rather than what we ‘want’ to do: A major factor in failed resolutions is that we often push ourselves into things that we don’t want to do. Our idea of a better life involves things that we believe ‘should’ be done, without accounting for personal preferences. Instead of dreading your new, daily, 5 a.m. jogging alarm, go for a run when you feel like it, and create more positive associations with the experience. When you look at all of these factors, plus the statistics behind the success of resolutions (~80% of resolutions are broken by early February), we clearly need to find a better way to go about personal growth. Our current situation leaves people even more disgruntled than they began, as not are are they still not exercising, still smoking, or stuck in their dead end job, but now they have evidence of their failure to change what they wanted to change. As a professionally trained ‘Solutions-Focused’ Coach, my recommendation for the future is for people to find solutions, rather than making resolutions. The main reason we make resolutions is because we are unhappy with, dislike, or want to improve something about ourselves, or our current state. This leads us to resolve to do something different in order to attain a future desired state. Let’s use losing weight as an example, because 55% of resolutions involve people wanting to get healthier/lose weight/exercise more. The main problem with resolutions is that they are goal-based, meaning that we externally motivated to achieve them. External motivation is the desire to reach some goal because of what you get at the end, versus internal motivation, which drives us to do things based on our inner desires. In this way, our resolutions will be a fight everyday, because we define success as reaching a goal that is often unreasonable. A solution to this, which is my preferred method for achieving goals, involves reshaping our attitudes towards the processes behind our goals. If you find a type of exercise that you enjoy, and learn to incorporate it into your routine, getting the recommended amount of exercise becomes much easier, and much less of a chore. 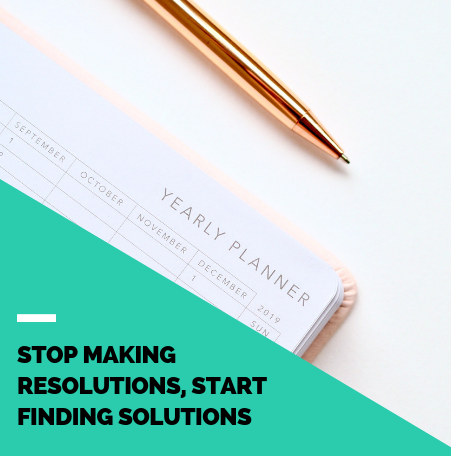 By applying this type of solutions-oriented, process-driven thinking to your life, you can say goodbye to your least favourite annual tradition: giving up on your resolution on February 1st. Older PostLiving in the Grey: How Can We Differentiate Between Black/White and Grey Communication?